Turning out to be a fantastic week for our Harmonic traders!. The twitter post midday on Oct 6th proofed to be, subsequent to the opening on Monday, the Low Of the Week and the first additional buy opportunity since the Monday open. So with today’s Fed (non)action SPY broke above the 161.8%XA target on the 30min chart, and briefly touched the previous 38.2% retrace of the daily chart. 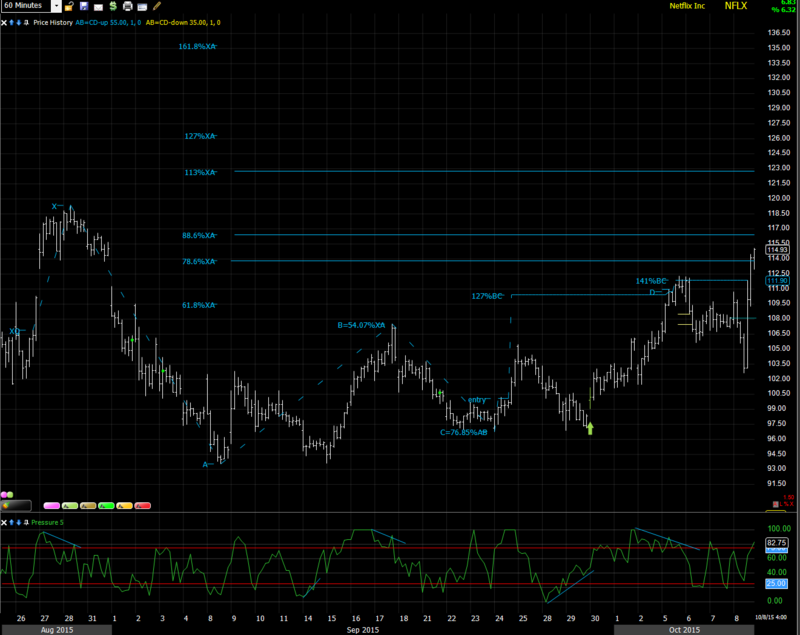 Looking at the daily chart, we see a possible CD PRZ target around 207.2, inline with the 78.6%XA. However from point B 202.9, to about 204 could be heavy resistance. We’ve had a great week, so for tomorrow I’ll play it safe, I’d suspect it would come down to test the 161.8%XA at 200. But will look for new patterns on intraday charts. reached its AB=CD target on Monday but dropped below it quickly there after. The pullback since Monday’s high was sufficient in order for the indicator to plot a new C point. It’ll have to hold above 92.5 on the 30min chart to consider a CD leg higher. last but least, wow what a move.after they announced a subscription fee increase. Monday IT reached the 110-111 PRZ area as mentioned in the Sunday post. 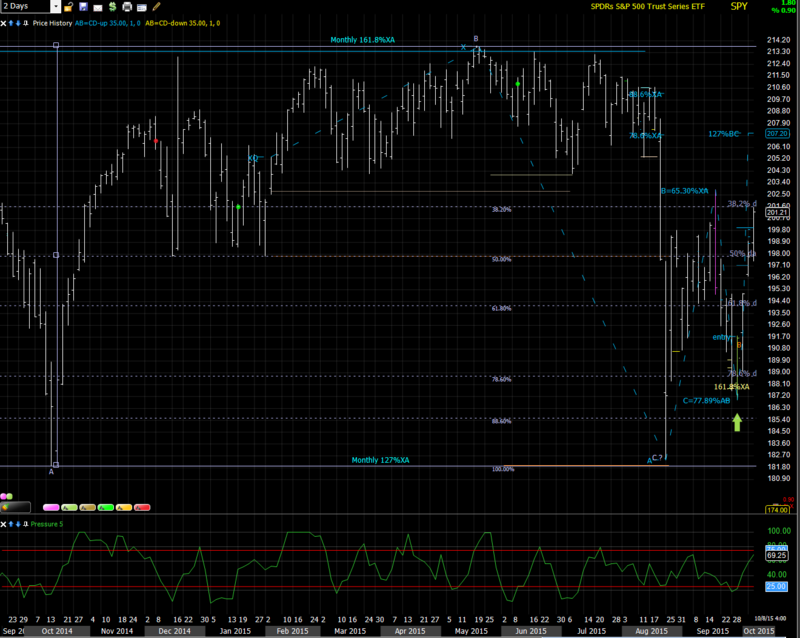 The pullback just exploded to the upside today, and in after hours touching the 88.6%XA. The discussed 115/120/125 call butterfly earnings play is looking promising. It was still trading around $0.40 – $0.45 today. By Monday or Tuesday we should start seeing some gains showing up if NFLX continues on towards 120. I have been following this a lot. One thing I can’t seem to understand is how you know when to enter? 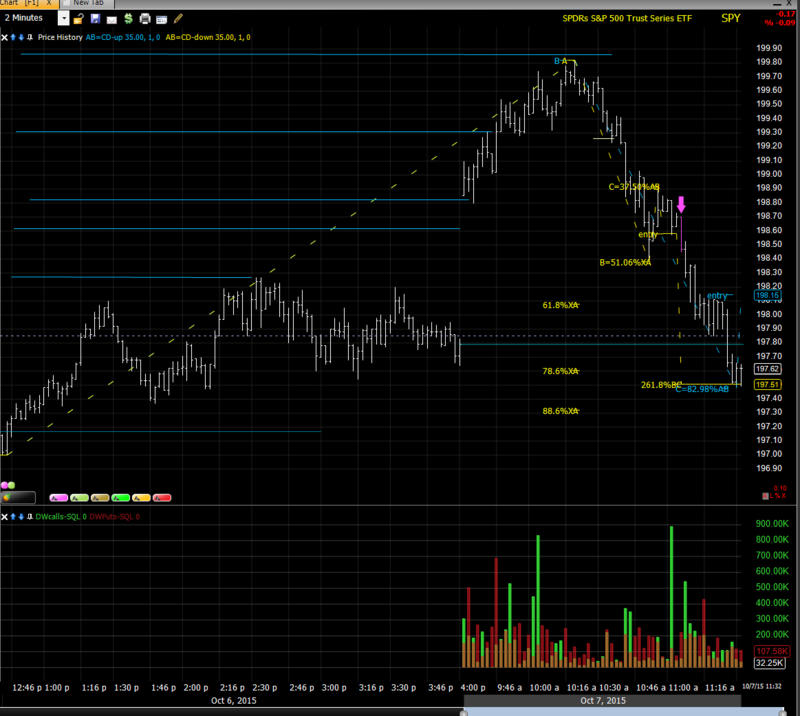 I can look at 1 min, 5min, 15min charts and see tons of AB=CD patterns forming but I never know exactly when to enter. Sometimes it tells me to enter but then it goes into a new low or a new high and I’m stopped out. Is there some kind of confirmation you use to know exactly when the best time to enter is? You seem to catch it perfectly every time. There are also times D never hits its target or never gets to PRZ. I guess this entire thing starts with where you assume point ‘A’ is. Is it at the beg of the day or is it close yesterday or mid day? Its incredibly easy to see the entire pattern in hindsight, but intraday not so much. Hi Kyle, thx for the question. I like to combine timeframes. If you noticed, I’ve been taking PRZ reversal trades of small timeframes 1-5min, while on larger timeframes 30-60min the stock already is on a CD leg. This week’s several intraday trades were good examples. 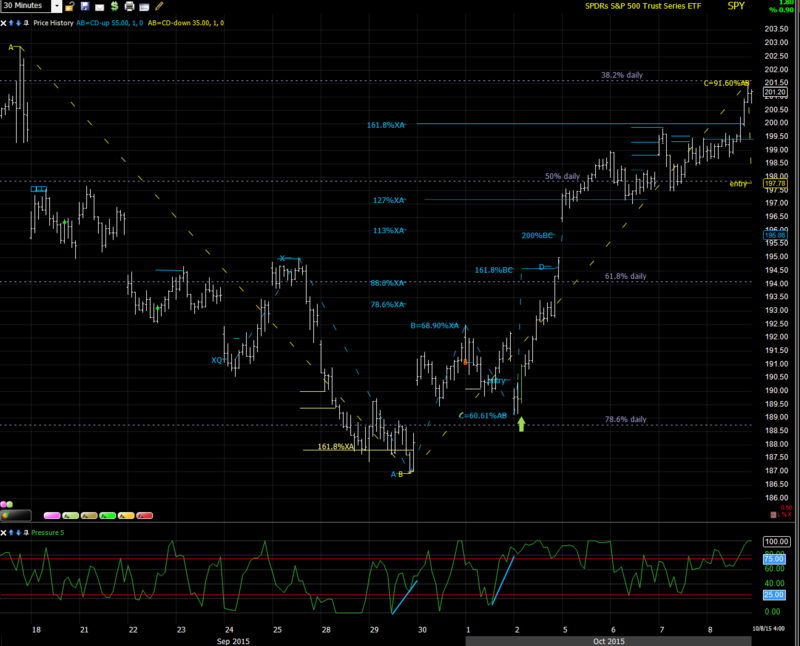 On 30 and 60min charts we saw clearly defined patterns. 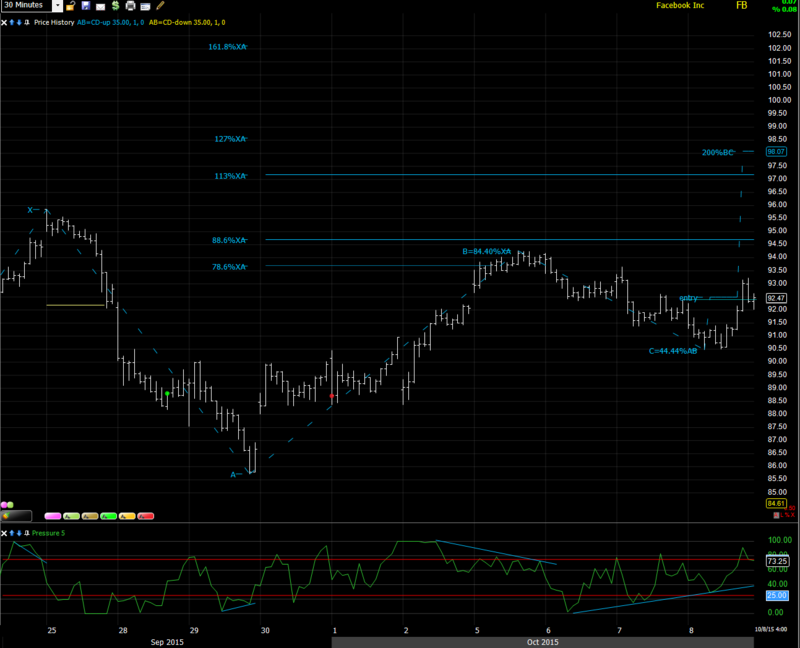 On intraday we look for small countertrend patterns, and take the PRZ trade, into the direction of the larger pattern. I’ll try and write a post about it soon. So the XAB=CD is the bigger 30min to 60min time frame and the smaller intra day is AB=CD? I wish stockfinder was free for charting so I can see how your code works. The indicator works on all timeframes. It has to adhere to certain rules in order to plot an AB=CD or XABCD. It describes the rules the indicator has to follow in order to recognize the patterns. if you’re completely new to Harmonics I recommend you’d read some books. the ones by Scott Carney are very good. But as I said, I’ll do another write up this weekend. Which book of his do you recommend? I see he has a couple on amazon. Its really weird. “Recommended Reading” doesn’t show up on my computer but on my cell phone it does. Thanks… I’m definitely going to look into it. I hope you have an affiliate link so you can benefit from it.